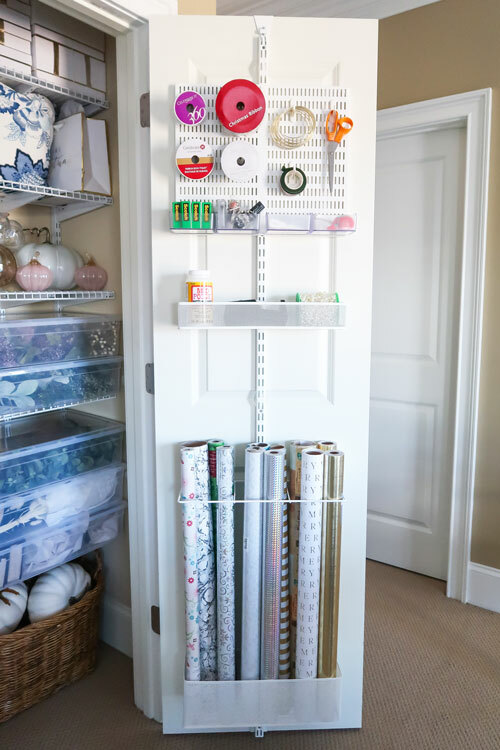 You are here: Home / DIY Projects / Create a Home Decor Closet and Gift Wrap Station of Your Dreams! 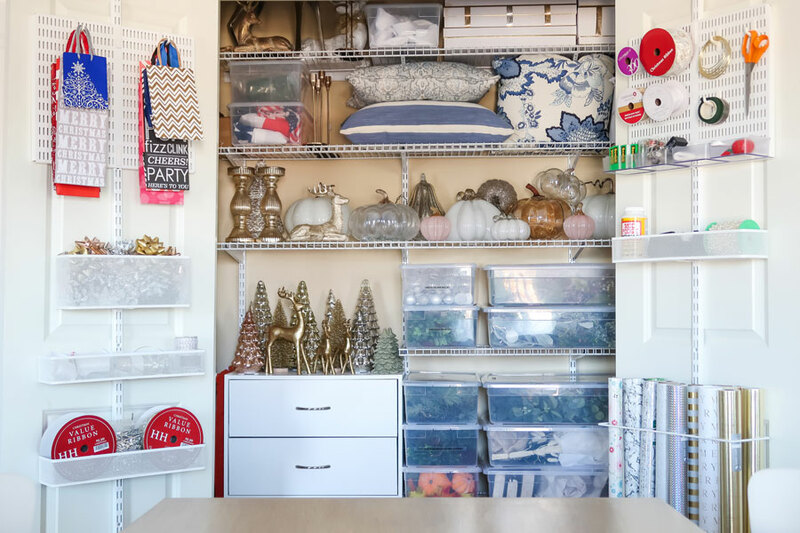 Are you struggling trying to keep gift wrapping supplies organized? 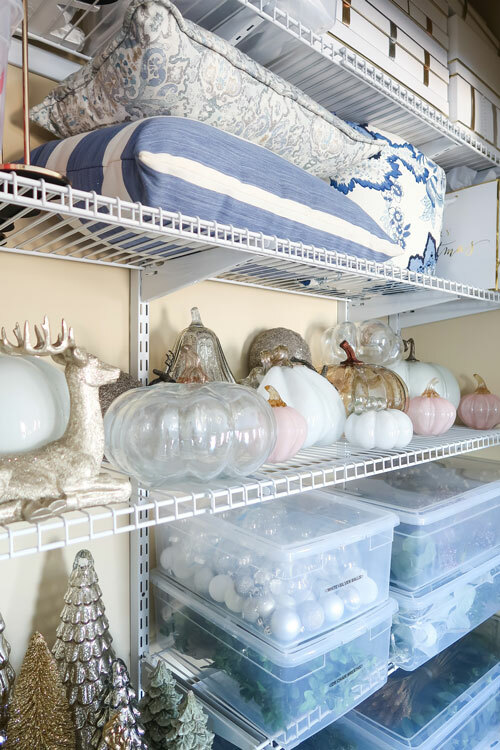 Or trying to find space to store your seasonal home decor? 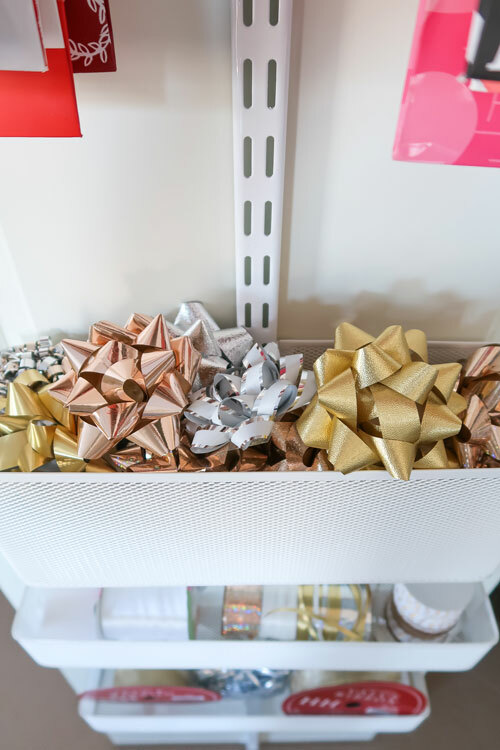 It’s time to get our gift wrap and home decor organized! 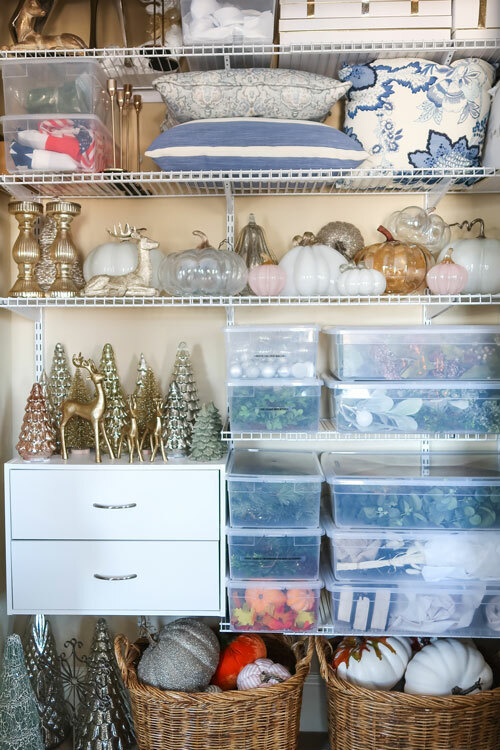 Are you wondering where to store everything when you transition seasons? 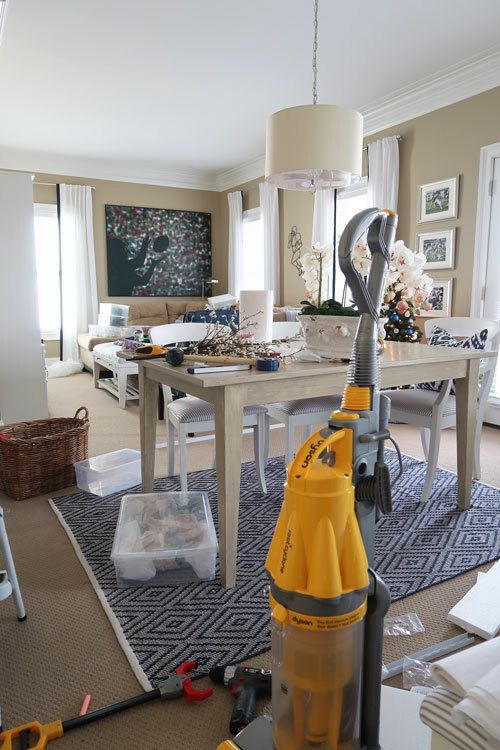 Trying to clean up the holiday decor mess? 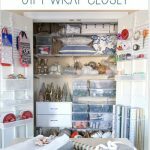 This was becoming a BIG problem at my home and I decided to take a very unorganized closet and turn it into a very useful space. 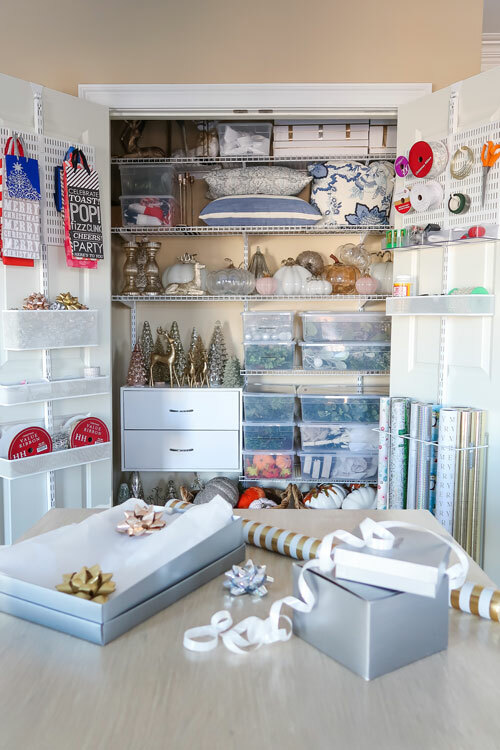 Yes, it’s a dream to have an organized home decor closet that includes my very own gift wrapping station! 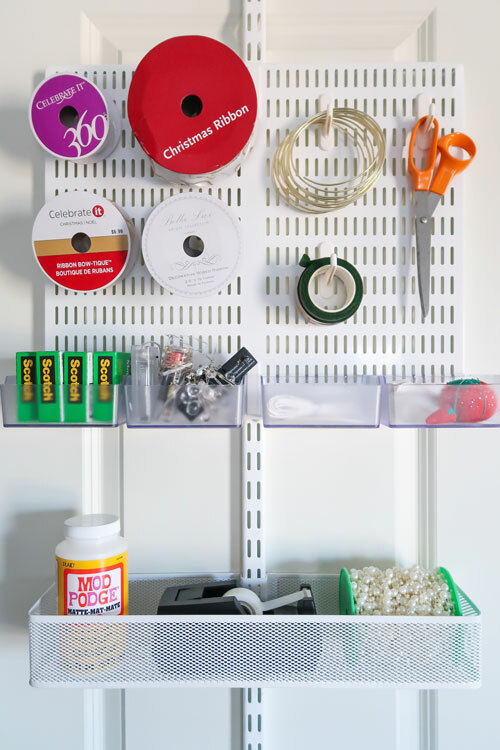 First of all, I have an issue with static white coated wire shelving. It’s the most inefficient use of space yet all builders install it in our homes. Over the years, I’ve systematically removed all of the wire shelving and replaced it with adjustable shelving on a track system. Here is what the closet looked like before I tackled the makeover. Oh yeah, this closet has been a dumping ground for 8 years and it was time for a change! Plus my son is now in college and I wasn’t sentimental about keeping the remaining toys (other than one or two). You can see I’d already attempted to make this closet work a little better, by taking out the bottom shelf to use storage baskets. Well, it still wasn’t the best use of this wide double door closet! It was time to pull everything out of the closet (including the shelves) and start fresh. This is what it looks like, after you take out the shelves. Not the most fun project, as you can see from the meme on this Instagram post! 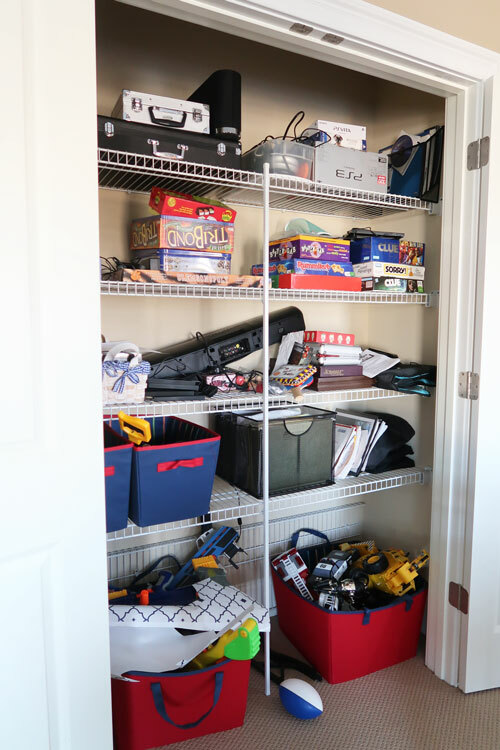 I had to start with a clean slate to make this closet work much harder and smarter in my home. 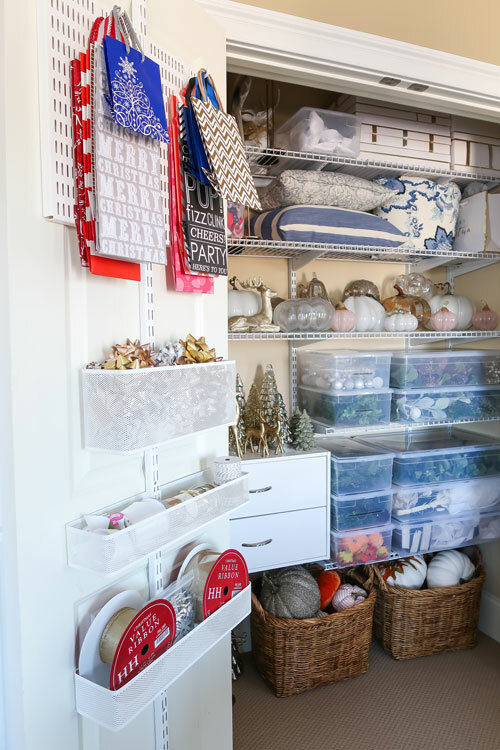 At the same time I did this project (because I am an over achiever), I installed shelving in my attic for Christmas storage and wreaths. Every closet other than my coat closet, has been made over with this system. Clearly it’s affordable at around $100 and an easy DIY for someone my size. Since I’ve covered basic installation in other posts, I won’t be covering it here. You should always follow the manufacturer’s instructions. Now I realize I had a LOT of space to work with, so you may only need half of what I used for a smaller linen or coat closet. All of the over the door storage I just saw is 30% off (1/16/19). NOTE: Please make sure before you buy anything, you measure! The over the door system has variations for different door heights and thicknesses. Also, please make sure you have at least 14 inches of depth for the shelves and can close the doors without issue. Throw away items no longer needed. Here is what my upstairs looked like mid-project. Don’t be scared! Something I considered, when finding containers, was “are they transportable”. Carrying them downstairs was key for me. Baskets and shoe boxes kept things light and easy for me to carry. Breakable or delicate items (glass trees/pumpkins) were best stored on a solid surface: shelf or floor. Really large objects and boxes fit nicely on the upper shelves where there was a lot of unused vertical space. 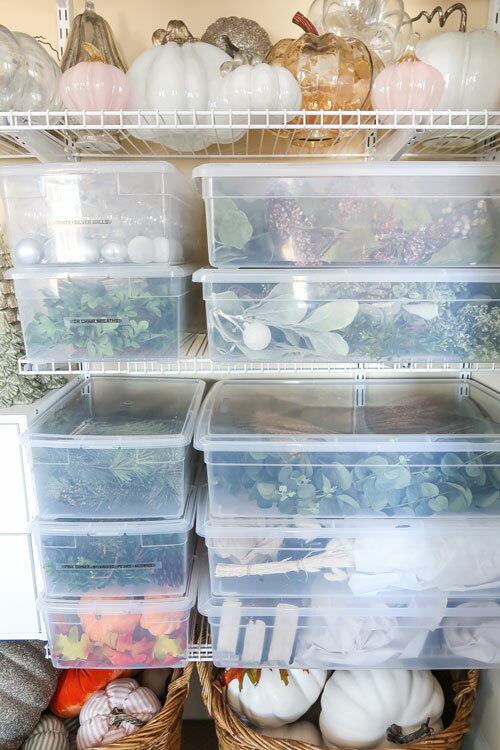 Storing garlands, stems, and mini-wreaths I found worked best in the boot and shoe boxes. Stuffed pumpkins and softer unbreakable went well in baskets that can be carried downstairs when I need them. You can see that some of the shoe and boot boxes are labeled with what is inside and I plan to do that for all boxes. I’m still going through them to see what needs to stay or go and will update that later. 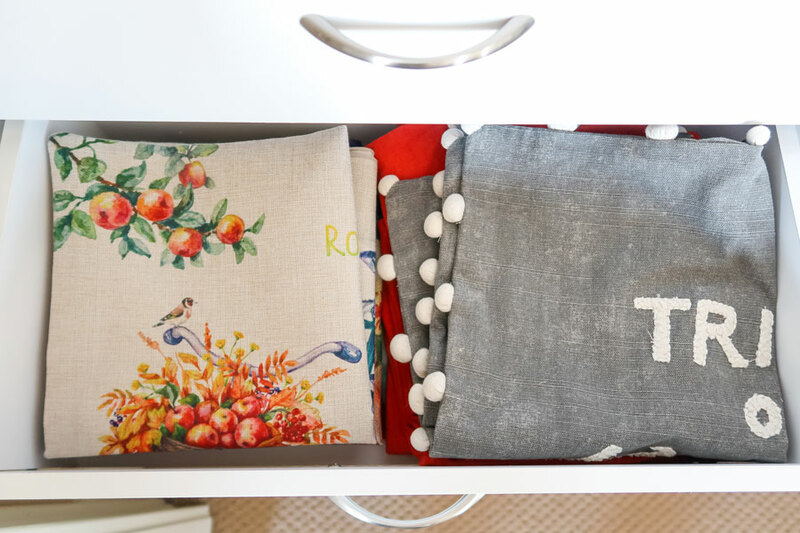 Then the drawers were a nice addition to store extra pillow covers and tissue paper. Plus the solid surface was perfect for my more delicate decorative items that wouldn’t be steady on the wire shelving. Heads up, the drawer instructions and online reviews are terrible! I am happy to have the drawer, but it was a royal pain to assemble. It’s so nice to have tissue paper in this space for gift wrapping! 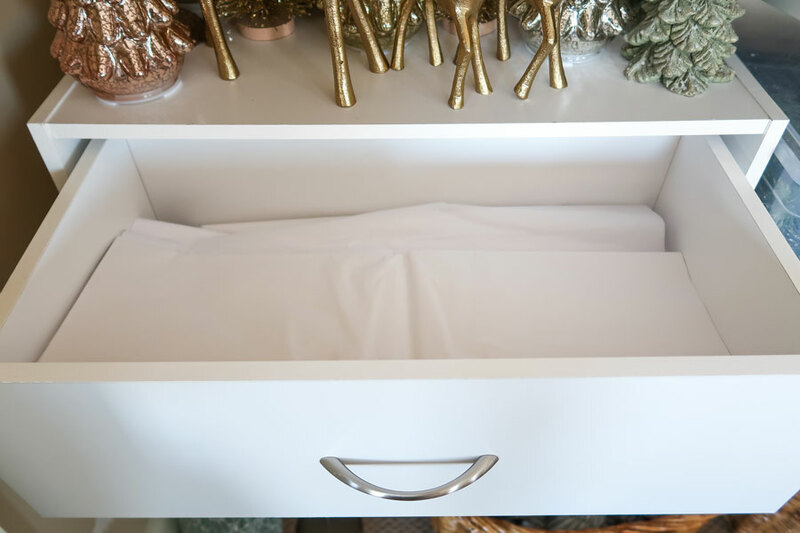 A drawer is perfect for keeping it flat and neat. I bought foldable fabric cubes too, but ended up not using them. My plan is to keep them tucked on the side wall and use them to transport the loose items, as needed. This was the first item I installed and LOVE it. Installation takes about 15 minutes and the components assemble to the track in minutes. My entire family used the gift wrapping station over the Christmas holiday to wrap presents. It’s the perfect location up and away from prying eyes and there is a table adjacent to the closet, that is the perfect wrapping surface. Everyone commented how nice it was to not have to go get the wrapping paper from the plastic container under the stairs. Then the best part is having the scissors, paper slicer, tape, bows and ribbons at the ready! On the other door, I made good use of the hook board to hang wine gift bags and smaller gift bags. Never have I had a perfect place to store those and if you are like me you love to give wine as a gift. Below that are bows and ribbons. Our presents were prettier this year, with everyone feeling more creative having everything at their disposal to decorate the gifts. The BEST part of creating this closet is that I can SEE everything. Now I will know what I have each holiday and shop from my closet first. Plus it’s climate controlled, so everything will stay in perfect condition. 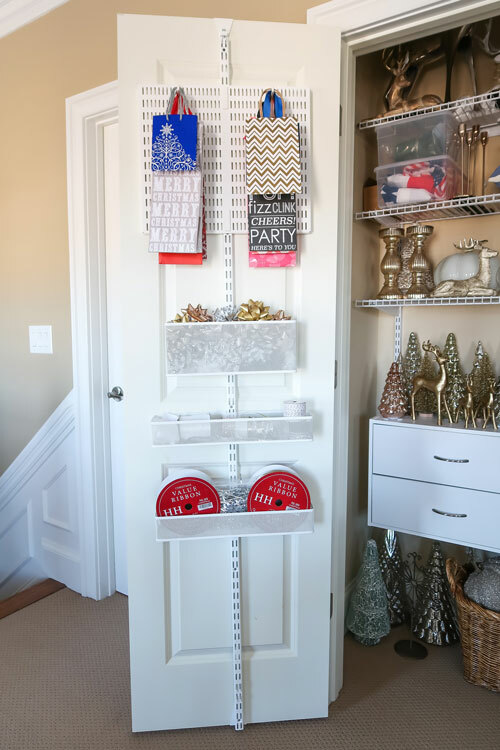 In just a few days, clearing out some clutter, and with a little elbow grease you can create a home decor closet and gift wrap station of your dreams! Want some other organizational product ideas? I’ve found 18 product that will help you maximize storage. Please consider signing up for my weekly email newsletter, so you never miss a post or great idea! « No Way I Was Using Marble in the Kitchen! Your closet is exactly the size and use that I planned for one of our guest room closets when we moved in our home almost 6 years ago. Unfortunately, Sweet Shark claimed it first as his golf closet!! It’s full of golf shirts, shorts, and caps. I would first have to find a place to move those so I could have the closet. Great job. I feel like such a DUNCE! 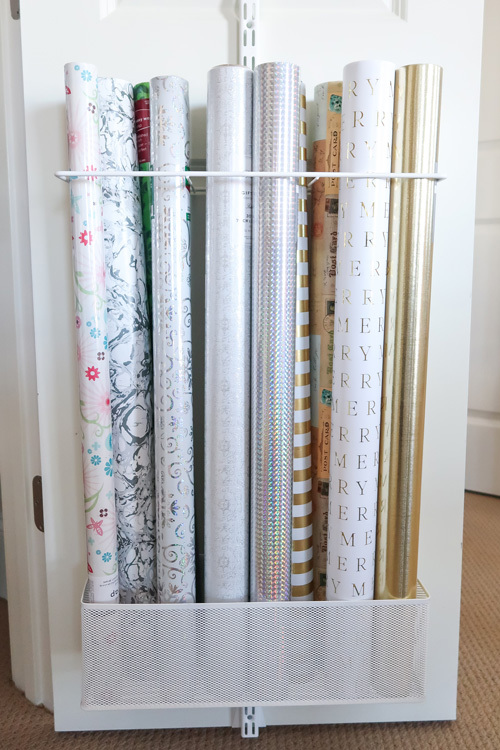 I already have a craft/wrapping paper closet. I need to get rid of a lot of craft stuff though, and use that space for storing home decor, but I never thought to add a scissors and tape so all the wrapping action could happen in that room instead of bringing it downstairs, and then returning the paper and ribbon upstairs to the closet when the wrapping was finished. Other than that, we think alike. I also used the Container Store door system and Rubbermaid for inside the closet. Yours looks great! Do you find yourself opening it just to admire it and make your heart happy? Linda, a dunce hardly! Glad I could give you one more idea because are are already on top of the home org 😉 Oh my yes, the week after I finished I would come up to my office in the morning and open the doors and then I would open the door to the attic where I hung my wreaths! Both projects cleared so much mind and actual clutter. Getting organized feels so good! Looks nice, Tracey! Much more practical and usable space. I don’t know why they install those awful wire shelves either. 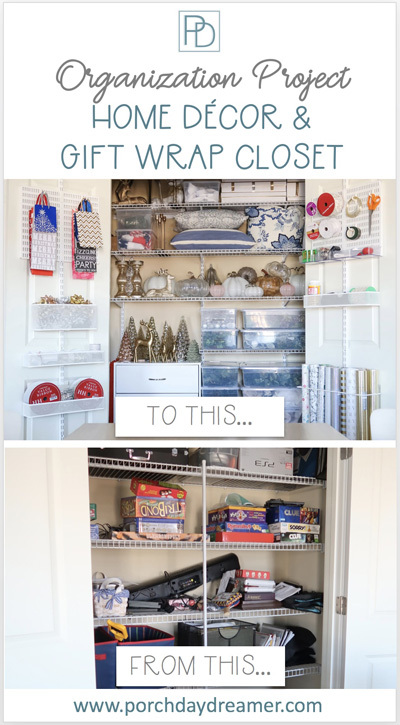 I have removed them in all my closets and replaced them with the Rubbermaid organizers too. And you can never have too many pumpkins!